Developed by Roland exclusively for Roland devices, VersaWorks™ adds powerful productivity tools to a robust software RIP with an easy-to-use interface that allows even novice users to take full advantage of the many capabilities of Roland printers and printer/cutters. This true Adobe® PostScript 3 RIP ensures exceptional production output with unmatched ease of use and incorporates the latest Adobe CPSI 3019 engine. Powerful doesn't have to mean complicated. We know what goes into Roland machines...and what it takes to get the most out of them as quickly and easily as possible. VersaWorks features include embedded ICC profile support, ink level adjustment tools, proofing capabilities, error diffusion and advanced cropping, tiling and nesting options. Choose from many print options and profiles including high-speed, high-quality and artistic modes. 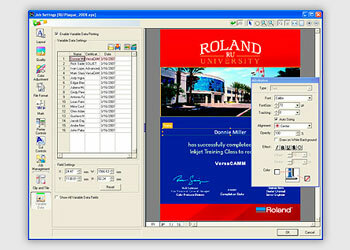 In addition, VersaWorks comes standard with powerful productivity tools like Variable Data Printing, support for up to four Roland devices simultaneously, ink usage and print time estimation, PerfCut for precision perforated cut lines, and the Roland Color system for accurately reproducing spot colors. VersaWorks is designed from the ground up for ease of use. With VersaWorks, you can access most of the functions from one global screen. For example, you simply click on the printer icon to open a printer settings window – or on the job preview icon to open a job settings window. Drag-and-drop capabilities allow you to quickly add jobs to the job queue directly from folders in your computer. In order to provide the highest level of compatibility with popular design applications, the latest version of Adobe CPSI (3019) is included. VersaWorks also supports commonly used image formats such as TIFF, JPEG, EPS (Encapsulated PostScript), PostScript and PDF. VersaWorks supports up to four Roland devices simultaneously, including printers, printer/cutters and cutters. With Roland VersaWorks, you can manage contour cutting across all Roland inkjet printer/cutters and cutters. You can also pair your Roland GX cutter with an inkjet printer for print/cut applications. VersaWorks features a PerfCut function that produces precise perforated cut lines on both cutters and printer/cutters. Roland Color is a revolutionary spot color fidelity system built on the Roland digital color solution. This powerful spot color matching system offers comprehensive color libraries and other features that allow professionals to quickly and easily match logos and other corporate identity elements. With Roland Color, you can produce highly customized spot color swatch books, swatch charts and peel-and-stick swatch sheets – right on your own media. These reference tools can be reviewed with customers to select the right color to match an established corporate or team color, or other vector graphic. Using all Roland equipment and supplies, you can print that color with 100 percent accuracy every time. There are three libraries within the Roland Color System. 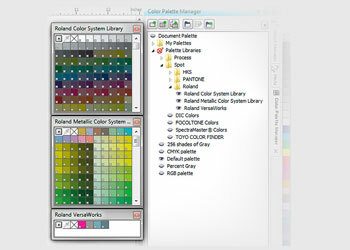 The Roland Color Library includes more than 1,000 spot colors for printing on any Roland inkjet. The Roland Metallic Color Library features 512 metallic spot colors that can be printed using Roland metallic eco-solvent inkjets. A third library supports specialized printing options for Roland’s white, clear and metallic silver inks and also manages contour cutting functions for Roland cutters and printer/cutters. VersaWorks also features a built-in PANTONE® library which automatically converts specific PANTONE spot colors in your design file to a CMYK value. This simplified workflow reduces the amount of time required for color matching and enables quick output of specific colors when working with properly profiled media. The extent of color matching can always be impacted by ink, media and printer setup. For color-critical environments, Roland recommends using color verification tools, such the X-Rite i1 color management solutions available online through Roland. Included in VersaWorks is a spot color replacement feature which allows you to automatically replace a defined spot color with any option from the Roland Color System – without reopening the file in graphics editing software. Choose from both standard and metallic colors for true creative flexibility. The Roland Texture Library allows LEC series, LEJ-640 and LEF-12 users to choose from more than 70 unique patterns and textures to be printed by layering clear coat ink.Design options including ginkgo, rhombus, circular, windmill, woven patterns and more. The Roland Metallic Texture Library allows you to apply custom textures and patterns to metallic colors created using Metallic Silver Eco-Sol MAX ink. 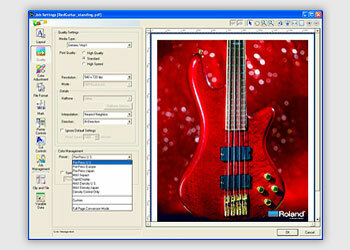 All Roland textures are easy to produce and supported by popular design software programs, including Adobe Illustrator. VersaWorks offers Variable Data Printing, a powerful feature that allows users to merge txt or csv data fields with a predefined design template to output variable text and graphic elements. Ideal for point-of-purchase displays, labels, name badges, plaques, menus and other custom graphics, VersaWorks Variable Data Printing allows you to quickly and easily produce a series of digital prints in which text and/or graphics change from one print to the next. 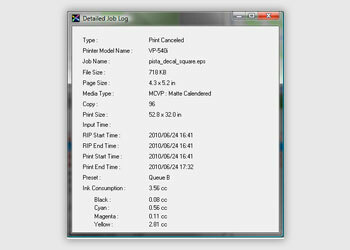 VersaWorks Variable Data Printing supports popular design applications such as CorelDRAW and Adobe Illustrator. With VersaWorks, you can choose from five preset color matching settings, including US Prepress, Euro Prepress, Sign & Display and others, to achieve the best image quality for the application at hand. 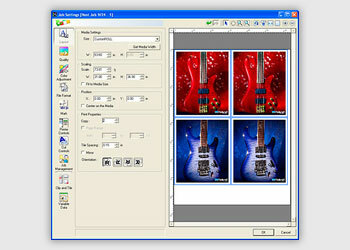 Other advanced features make VersaWorks one of the most convenient and comprehensive RIPs available, including the ability to preserve the purity of primary colors, adjust calibration curves, independently render intents for raster and vector objects, and simulate output color on screen before printing. The Job Log feature within VersaWorks keeps a comprehensive record of all jobs that are processed through its queues by tracking the job size, ink usage, printing time, media information and more. 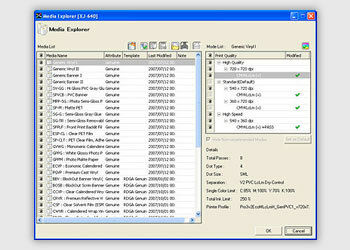 The log information can be exported into Microsoft Excel supported formats (csv or xml) for record keeping purposes or for further analysis such as monitoring the ink and media usage. VersaWorks allows you to connect an unlimited number of clients for unattended printing throughout the network. Client computers can send jobs to the server (computer with VersaWorks installed) through a shared network printer driver. VersaWorks also supports full bi-directional communication with the printer, enabling users to poll the width of the media currently loaded on the printer, the remaining ink and the current status of the printer. VersaWorks also supports printing from Macintosh clients, provided that the server OS supports AppleTalk. With Roland@NET, you can choose to have VersaWorks check periodically for software updates or printing profiles and automatically download and install the updates through an Internet connection. You can also have Roland@NET download only the profiles you need. This powerful feature ensures that you always have the right profiles and the most up-to-date software iteration available. VersaWorks includes a predictive ink calculator that estimates the amount of ink needed for each job, allowing for flawless unattended printing. When there is not sufficient ink to complete a job, the RIP notifies the operator prior to printing. VersaWorks supports industry standard ICC profiles and comes with a number of profiles for award-winning Roland media. VersaWorks is also compatible with profiles created through standard profiling packages. 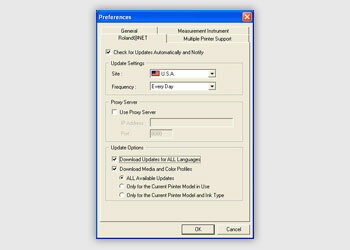 Additional profiles are available through the Roland@NET service. Media Explorer is a wizard-based media management feature that allows you to create new media types, adjust the corresponding color settings for each print mode, and create custom profiles. Advanced layout features streamline the printing process, allowing you to save both production time and media. Using VersaWorks, you can manually or automatically tile jobs that exceed the media width or that need to be cut into smaller sizes. Modify tile sizes easily by typing in precise parameters or by dragging the tile border with the mouse. Minimize your media usage with the nesting feature that allows you to print multiple jobs together. After nesting, you can manually mirror, rotate, resize or change the position of each job. You can also select the Reorder function, which automatically rearranges the jobs into the most media-efficient layout option.